Bomy’s Flutter: Really good read, greatly plotted, amazingly delivered, engaging and entertaining with lots of juicy fangirling material! I’m probably one of the very few book bloggers alive who hasn’t read The Iron Fey series yet, despite my repeated planning to. But I did read The Immortal Rules and loved the way Julie Kagawa writes, so it made sense I’d start reading around The Iron Fey series but not the first book. So the world of The Iron Fey was new to me, I mean entirely new since I had no idea what it was really about. And the word ‘fey’ was a big risk here, I tend to not fall for fey stories for some reason. This time, however, I was very close to 100% into the world, especially the Iron section of it, it just blew my mind how imaginative, quirky and charming it was. Seriously, I was like squirming in awe as I read about the Iron realm. Seriously, soundly, undoubtedly genius world building. I mean, the whole world of the series is genius, but the Iron section was just jaw-flapping amazing. The characters were of the instant crush material kind for me, especially since I have a soft spot for male POV stories. Ethan was like this incredible blend of the amazing fey-fighting ninja and the hero type all merged into one sort-of-grumpy, absolutely adorable guy. I just ‘felt’ him from the first line of the book, and we never parted ways after that. He was real and easy to relate to and just got me sold 4 seconds into the read. I liked to follow him through the read as he reconsidered some things but stood by others, he was gutsy and I loved that about him. Other characters were great too, like Kenzie, she was awesome too, no fluff about her and she made perfect sense with this ‘tough guy’, I just loved their chemistry and the vibe the two of them had when they were together. Kierran was cool, really intriguing, like right now I’m totally still thinking about some of his reactions, and I’m looking forward to read more about him. There was a bit of the ‘What the…?’ factor about him, and after reading you’ll understand what I mean about that but I’m not giving the bomb away, lol. The story was really interesting, I mean so much juicy conflict it was practically exploding out of the pages, and clear tension from the very first lines of the book. This was obviously going to be a good story, you can just tell right there, first line in. And it delivered on those expectations, we’re talking a lot of action and yes, sword fighting again. I say again because it was there in The Immortal Rules and I loved it. One thing is clear, this author can write like it’s nobody’s business. I mean if she could make me love a read about fey, for quill’s sake! Fey! I almost never like fey stories and I loved this one! Plus this is a first person narrative from a guy’s POV, Ethan’s, there’s really nothing more I could ask, lol. Awesome, awesome scene building, suggestive imagery and all senses environments, characters that have a clear and resonant voice on top of dynamic action and madness going on, feeling, drama…it just has it all. Her books are like a one stop shop for almost all good bookish things, that’s what I’m saying. And, even if it weren’t her awesome self as author, just look at that cover & blurb! It’s a killer combo, it sells itself to you without a doubt. So curb appeal, off the chart. All in all, this was a really good read, greatly plotted, amazingly delivered, engaging and entertaining, with lots of juicy fangirling material. So in case you haven’t read this already, you just gotta give it a try. I say it’s a must read, definitely. 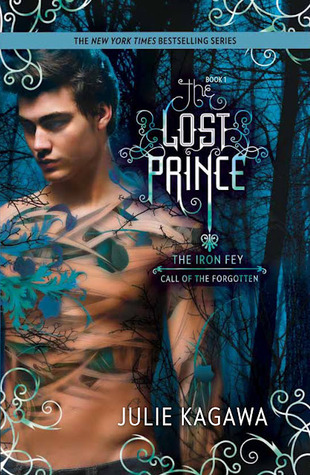 Read The Iron Fey series already? On a scale from 1 to 5, how much am I going to fangirl over Ash? Because from what I saw in this book, I’m thinking a 5+, definitely. Am I right or am I right?